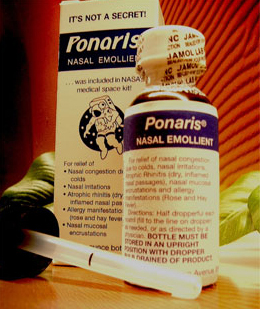 This cold season reach for all-natural Ponaris to relieve your stuffy, congested nose, post-nasal drip, and nasal dryness. Once standard in NASA's medical space kit, this effective formula contains oils of pine, eucalyptus, peppermint, cajeput, and cottonseed. Ponaris is a compound of carefully selected mucosal lubricating and moisturizing botanical oils, specially treated through the exclusive J-R iodization process since 1931. Do not use if protective seal is torn or missing. Do not give to infants or young children except on the advice of a physician. Pregnant women should consult a physician before using this product. Do not exceed the recommended dosage unless you consult a physician first. Each drop of "Ponaris" contains approximately 150 mcg of iodine. Consult your physician if you are concerned with your iodine intake. Keep all medicine out of the reach of children.